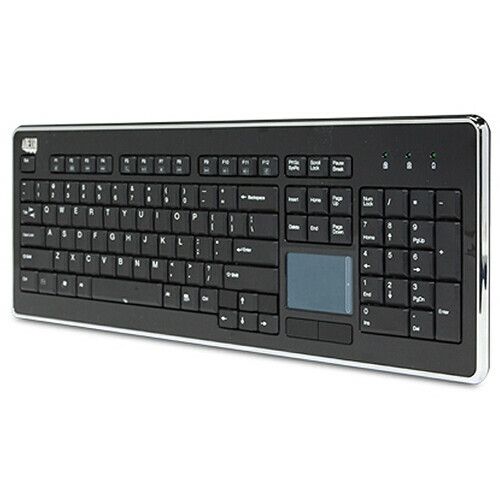 The Adesso SlimTouch Desktop Touchpad Keyboard is a wireless keyboard that offers a full 104-key QWERTY keyboard layout, built-in touchpad, and multimedia and Internet hotkeys. In addition to your touchpad this keyboard also features a scroll pad as well as left and right mouse buttons. This allows you to navigate documents and Web pages without the use of a mouse. Its wireless connectivity also allows for a tidy, clutter-free work space without additional cables, wires or line of sight receivers. This keyboard allows you to control your PC from one convenient location. With its clean lines, elegant chrome accents, and piano finish design, this keyboard adds style to any room at home or at the office. With 2.4GHz RF wireless technology and 65,000 IDs on 12 channels you can enjoy 30 feet of wireless freedom. The Glidepoint Touchpad technology provides optimum cursor control at and its central positioning on the keyboard offers comfort and convenience. The built-in touchpad also saves desk space by eliminating the need for a mouse. Multimedia hotkeys let you control channel selection, volume, track skip, record, pause, fast forward, rewind, and more. Internet hot keys provide quick access to web browsing. Automatic indicator lights, a power saving feature and On/Off switch allow for extended battery life for long-term use. This keyboard features a slim design with chrome accents and a piano black finish adds a touch of style to any room. 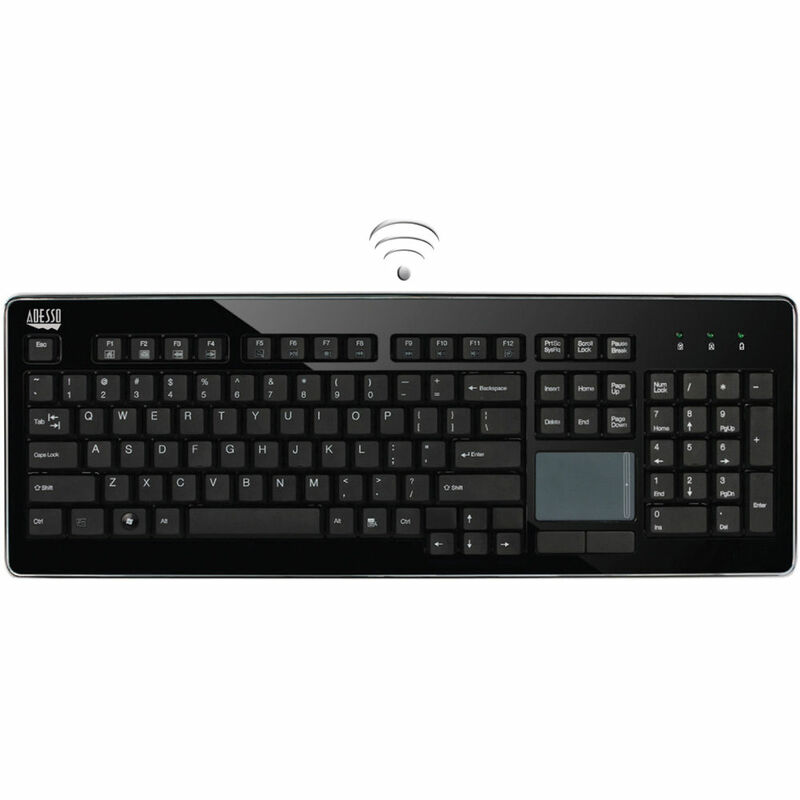 Box Dimensions (LxWxH) 18.9 x 8.0 x 1.4"
SlimTouch Desktop Touchpad Keyboard is rated 4.5 out of 5 by 2. Rated 4 out of 5 by Anonymous from I would buy again. In a flash. I have the dongle into a shared switch-box. I therefore can use the keyboard wirelessly with two PC's. It is finished well. Works well! The keys have a great tactile feel. Sure-footed typing. with my fingers, hah! The glide-panel is positioned perfectly, so you don't brush it while typing with the letters. And the glide-panel is perfectly responsive right out of the box. I hope they keep this model in manufacture for when I wear this one out. The way it is performing, that will be a long time. Rated 5 out of 5 by Anonymous from I did buy this product again This is a very nice keyboard. I have been using one for a number of years but got careless and let the batteries get corroded - thus causing it to fail. Replaced it because of the satisfaction that I got from the original. Would highly recommend.